IB-Control: The perfect add-on to your Intellibox system! The IB-Control works in conjunction with -- and provides the same functionality as -- your existing Intellibox. It connects to your Intellibox via a 6-wire phone cable. A 2-meter (6-foot) cable is included, but I can provide you with a custom-made cable of virtually any length. · Flexibility - You can position the IB-Control anywhere on your layout; it doesn't have to be placed next to the Intellibox (although you can do that too if you'd like). Many people place their IB-Control on the far side of their layout, making it easier to start/stop or control their layout from a remote location. The connection is with a simple 6-wire phone cable; you're not restricted by length as to how far away from the Intellibox you can place it. · Convenience - With the extra controllers -- and the ability to place the IB-Control virtually anywhere on your layout -- you can have your friends or children operate their own engines independently of those you control. · Expandability - You can add ("daisy-chain") additional IB-Control units around your layout to provide added, convenient control for yourself or others. · Added features - Unlike the Marklin controllers, 2 people can actually operate the same engine at the same time. The LCD will warn you that someone else has control of an engine, but it will still let you operate it. 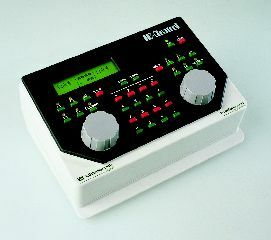 · Value - The IB-Control costs LESS than a comparable Marklin 6036, yet provides 2 controllers and a lot more functionality. The IB-Control is the perfect addition to your existing Intellibox layout.